The C.H.E. Cafe hosted a vegan potluck to celebrate the first anniversary of the beginning of the C.H.E. Cafe sit-in and occupation, which protested the UCSD administration’s attempts to evict the building. Following Saturday’s potluck was a benefits concert for Groundwork Books, which was meant to strengthen the bookstore’s position in lease negotiations. Currently, the C.H.E. Collective is in the process of negotiating a new Master Space Agreement. According to University Centers Advisory Board Chair Claire Maniti, the new MSA will be based on a proposal made by the Co-op Advisory Committee, which is composed of representatives from all UCSD co-ops, including the C.H.E. Collective, A.S. Council, the Graduate Student Association and UCAB. In addition, Maniti told the Guardian that the need to create a new MSA is not a result of the C.H.E. Collective’s activities, but is because the leases of all of the co-operatives are expiring this year. However, Maniti discussed that the Office of the Ombuds ensures that all parties involved in negotiations are able to freely communicate their terms. Though the university retains the ability to evict the Cafe on short notice, Muir College senior and C.H.E. Collective core member Raquel Calderon does not believe administrators will evict the facility in the near future. Maniti confirmed that all negotiating parties are aiming to finalize the new MSA by Week 8 this quarter. She also stated that the university has spent $350,000 on installing a fire sprinkler system to the facility and on improvements that will help it meet the standards set by the American Disabilities Act. UCSD Communications Manager Christine Clark confirmed to the Guardian that administrators will continue working on the facility throughout the summer. C.H.E. Cafe Attorney Andrea Carter told the Guardian that the C.H.E. Collective requested an interim agreement to secure the Collective’s position on campus while the lease was being negotiated. However, the university has remained unresponsive. The C.H.E. Collective Campus Reintegration Committee was formed as part of a measure A.S. Council passed in Winter Quarter 2015 to help the Collective become more student-centered. 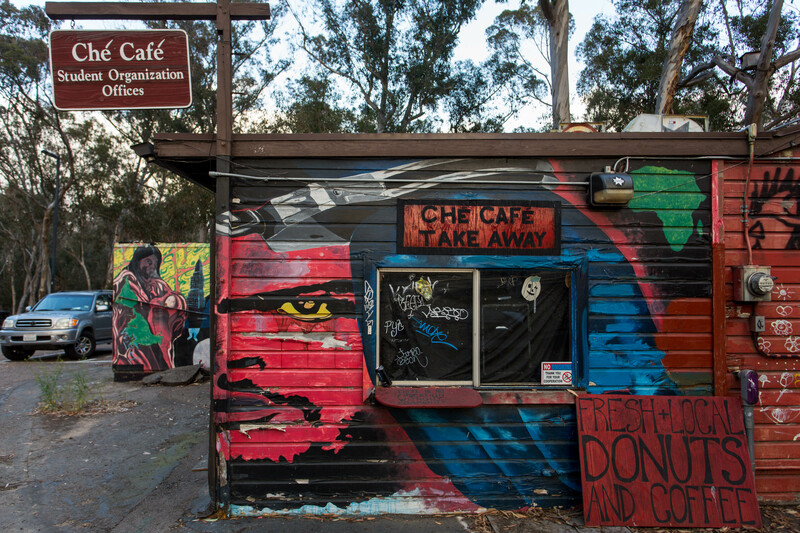 Though the Collective opposed some parts of the measure, such as the vacating of the Cafe during renovations, part of its purpose is to ensure that members of the Committee could approve any physical changes to the Cafe before being implemented by the administration. Paolo Gabriel, a graduate student and member of the Committee, told the Guardian that the Committee has been necessary in including the C.H.E. Collective in the new MSA. Calderon confirmed to the Guardian that the C.H.E Facility will be suspending operations for the summer. This article was co-written with Tina Butoiu.